Preheat oven to 350˚F (175˚C). Lightly grease a 9"x5" loaf pan. In a large bowl, combine flour, baking soda and salt. In a separate bowl, cream together butter and brown sugar. 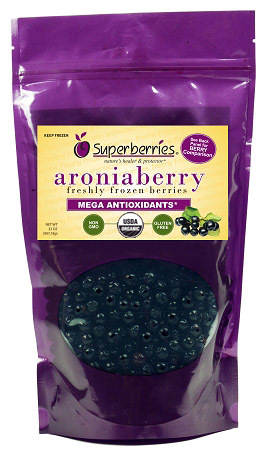 Stir in eggs, mashed bananas and Superberries fresh-frozen aroniaberries until well blended. Stir banana mixture into flour mixture; stir just to moisten. Pour batter into prepared loaf pan. Bake in preheated oven for 60 to 65 minutes, until a toothpick inserted into center of the loaf comes out clean. Let bread cool in pan for 10 minutes, and then turn out onto a wire rack.